If our recent post about a giant garden hedge proved anything (apart from the fact that our world has some incredibly large greenery of course) it’s that we love a good hedge trimmer here at Garden Toolbox! We are also advocated of shrub trimmers and shears. Sure, we’ve seen some pretty ratty hedges in our time but for the most part a garden hedge remains a well tended and attractive border to your garden, helping add a bit of character and a natural solution that a fence just can’t manage. We love it even more though when people decide to partake in the art of topiary, turning something that would have been a small attractive border to their front garden into something that turns peoples heads as they walk down the street. 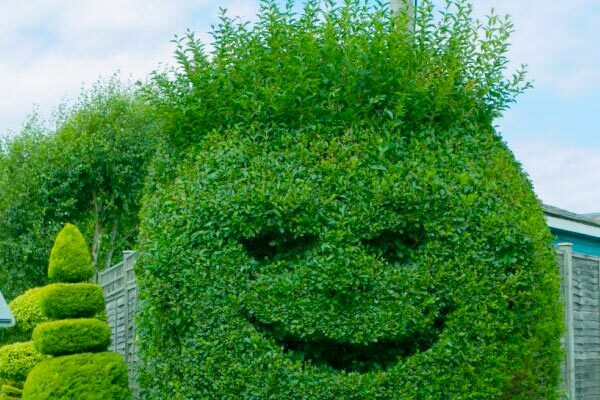 So, with this in mind we’ve took a look around the Internet to find some of our favourite examples of topiary. It’s a collection that makes us want to get out our garden shears or secateurs straight away and set to work creating something that probably won’t even be half as good! It’s always good to get a thumbs up from a hedge when you’re walking down the street a lovely bit of landscaping, even if you have to double check if you were just seeing things! The huge smiley face and spiky hair on this topiary example is charming off, but teamed with the bush behind it the design gives the impression that he’s giving you a thumbs up as you walk past. It’s almost as if he’s saying “Don’t worry about the name, there are honestly no crabs here”. His huge mouth probably swallowed them all up! The great news is this work will attract the birds back too. 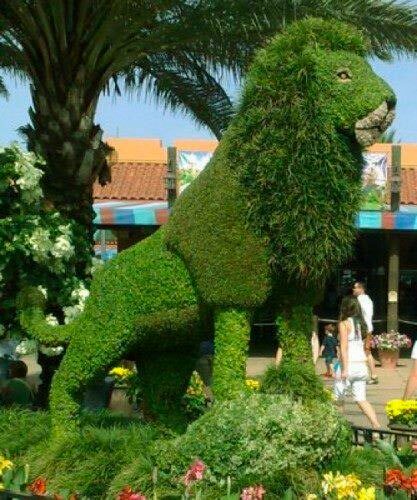 Lions seem to be a favourite amongst those who practice topiary, maybe it’s because people like growing the somewhat dishevelled mane? In any case this is the best one I found, and a very proud green lion he looks indeed! Just looking at a construction like this you’ve got to appreciate the creativity and complexity that goes into creating such designs. 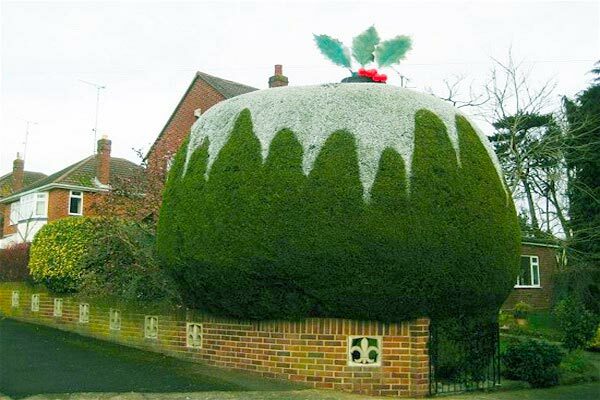 This giant Christmas pudding themed hedge took six years to create out of a pair of 20ft conifers. It was designed by Roger and Valerie Holley from Yeovil Somerset, inspired by a comment from their 12 year-old granddaughter who said “that looks like a massive Christmas pudding”. Every summer the couple works on the shape to make it even fatter; before using watered-down white emulsion paint as cream and popping a holly on top just in time for Christmas. One year they even added a robin! I’d say it looks good enough to eat, but I’m not a fan of Christmas pudding. I do love their hedge though! 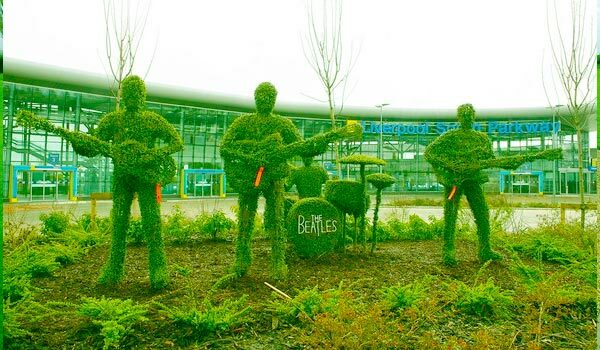 It’s hard for anyone to not recognise the Fab Four, and Liverpool – the city that The Beatles came from – decided to honour them by fashioning topiary in their image outside the city’s South Parkway train station. It took 18 months to grow the band, only for someone to lop the head off Ringo Starr, probably thanks in part to a few comments he made about Liverpool and not exactly missing the city. Ringo’s head is now back and The Beatles remain in green form to to this day. I have to admit that I don’t mind the odd bit of Formula 1. Some people wonder how you can enjoy a few fast cars going round and round a race track for a couple of hours, but for me it’s a good thing to stick on the TV on a lazy Sunday. 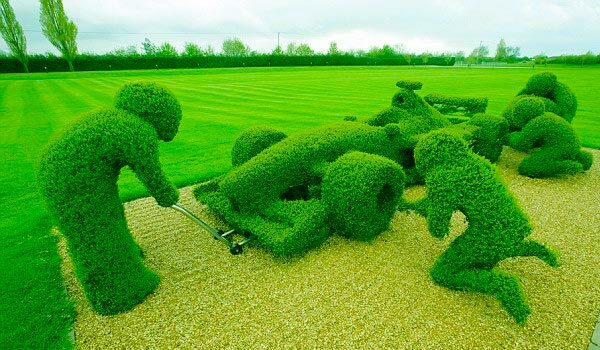 This Formula 1 inspired topiary is actually outside the Williams F1 headquarters, where a team of gardeners spend hours every month making sure it’s trimmed. The car, originally made for a Ferrari but purchased and re-shaped by Williams, is 11ft long long and is made from six plants. Attending it are 6ft high mechanics, each made from two plants. Crafting the car and its mechanics was a slow process, as it took two-and-a-half years for the planting to grow around their metal frames and completely cover them. The results were definitely worth it! We all love a bit of Disney, so here’s the cast of Toy Story 3 in loveable topiary form! These are situated at Epoct in Walt Disney World, Florida. 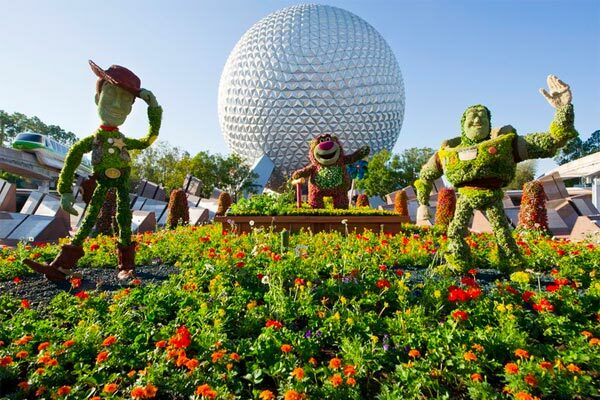 There are far more than just these three though, and in fact the Disney park holds the Epcot International Flower & Garden Festival every year, showcasing over a hundred carefully crafted topiaries. 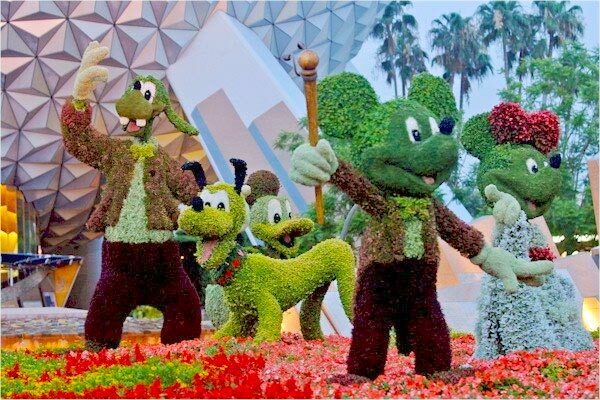 If you want to see your favourite Disney characters in plant form then the festival would be the perfect time to go. That’s your lot…wait, you want another Disney one? Oh go on then! 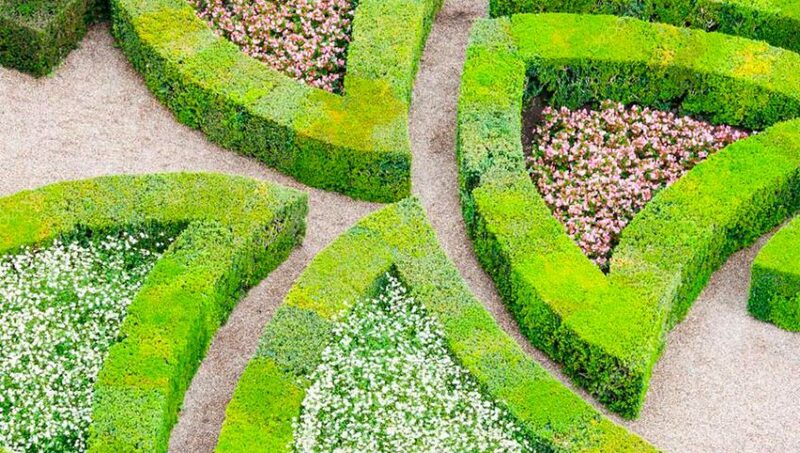 If you have a topiary or hedge in the shape of something or know of any you can view then let us know, we’d love to see pictures!